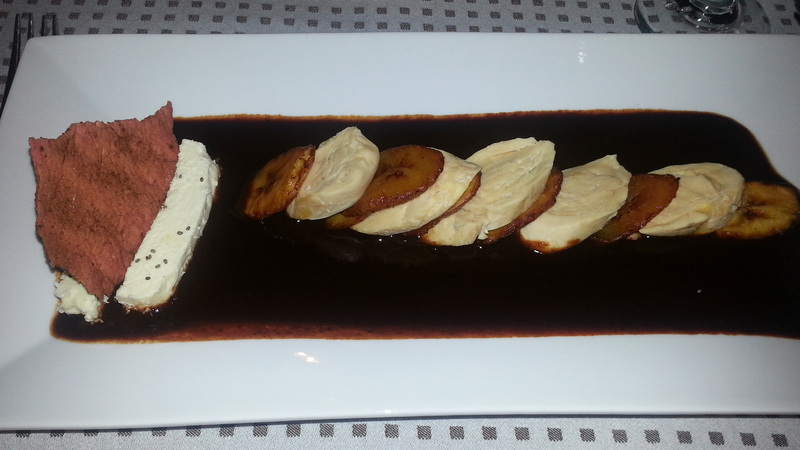 A recent trip to Mexico, as with previous visits, was a sensory treat. Besides the beautiful sites, thanks to the generosity of my cousins in San Luis Potosi in the central part of the country, we were indulged with exceptional meals. I’d heard about enchiladas Potosinas, and was happy they were served the night of arrival. This set the bar for subsequent foods. Shaped more like empanadas, red sauce-infused corn tortillas are stuffed with cheese and salsa. They’re lightly fried for a crispy exterior texture that contrasts with the creamy cheese filling. My cousins provided numerous opportunities to sample other dishes popular in the region, including gorditas, sincronizadas, chiliaquilles, enmolladas and fundido with chorizo. Sincronizadas can best be described as stacked quesadillas. Ham, cheese, salsa between layers of flour tortillas made this an especially flavorful brunch that also included beans and freshly-made green salsa. Although, normally served as a snack or simple meal, molletes were added to the menu simply because my cousin knows I like them and it was our last day in Mexico. It was far too much food, yet far too difficult to stop eating. 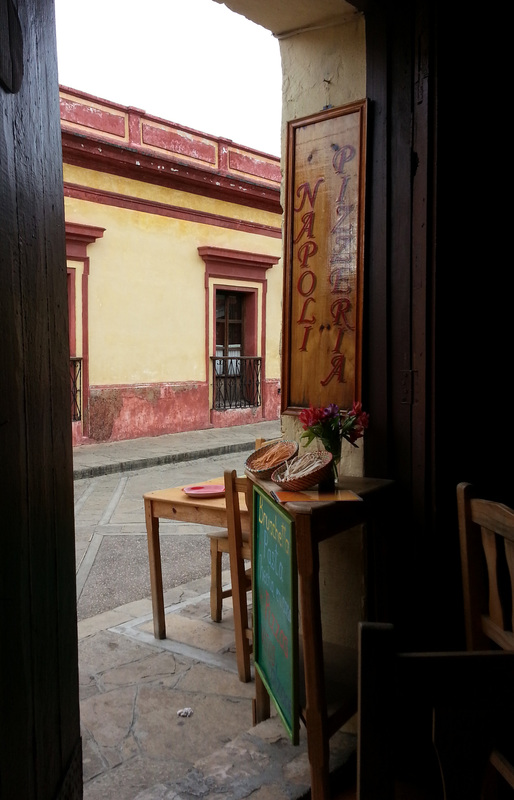 Part of our trip we began one day in Guanajuato with chilaquilles covered with pasilla sauce and ended it with enmolladas (mole enchiladas) and tamarindo margaritas in San Miguel de Allende. Not a bad way to dine/visit. Tacos are part of the national cuisine, so our stay would have been incomplete without them. Fortunately, the tacos al pastor, among others, at Taqueria Arandas ensured our palates, and stomachs, were well-sated. Lara & Luca has no view of the beach, but it was my favorite restaurant in Playa del Carmen thanks to the well-prepared food and our exceptional server. The hip little eatery far from the tourist scene also serves up some impressive chilaquiles. The fresh-made juices aren’t too bad, either. Nothing beats fresh-squeezed orange juice (jugo de naranja); those who ordered the green juice (jugo verde) were equally pleased. The latter is a blend of fruits including pineapple, orange and chaya – tree spinach – and perhaps other ingredients we didn’t quite hear or correctly interpret. In either case, it was deemed refreshing. Breakfast is served until 2 p.m. The menu features a variety of egg dishes, French toast, croissant sandwiches and pancakes. Most in our group of 10 ordered the chilaquiles, topped with two fried eggs or shredded chicken. Typically, I am not a fan of eggs, especially runny ones, but for some reason I wanted the traditional version — gooey eggs and all. The silky yolk provided a subtle balance to the full-bodied green chili sauce. Pieces of fried corn tortillas mixed with onions and cilantro are covered sauce. The eggs and a dollop of cream practically float on the mixture. This was a hearty serving. Although I tried to finish the plate, it was too much. The restaurant is clean and comfortable. The playlist had us tapping our feet and discussing the musical artists. When it came time to leave, our server and the owner stood out at the curb to hail a cab. Stupendo! 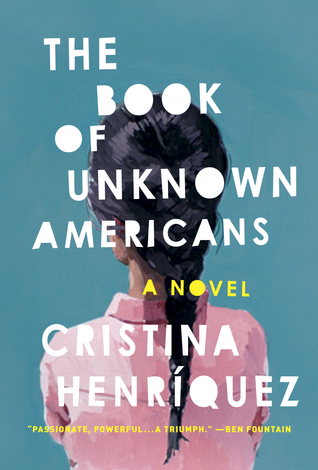 The Book of Unknown Americans by Cristina Henriquez is a timely read with the issue of immigration never far beneath the political surface. Yet, the novel isn’t about politics, but people. Arturo and Alma leave Mexico for Delaware because they want to do more for their teen-aged daughter, Maribel, who suffered a brain injury. They believe she’ll benefit in a better school. They’re not illegals; they have work visas. Each chapter is told from one of the character’s perspectives, some in greater detail than others; only never Maribel’s. Woven in with the challenges of living in a new land with a new language is the relationship that develops between Maribel and Mayor. This sums up the experience of those introduced in the book. Henriquez has created a montage of immigrants: from Mexico, Panama, Puerto Rico, Guatemala, Nicaragua, even Venezuela and Paraguay. These places are all part of the Americas, which is what makes the title so appropriate with its double entendre. In brief, compelling chapters, among those told in Alma and Mayor’s voices, the neighbors share their pasts explaining why they left their native countries for the U.S.A. I was surprised at the diversity of restaurants, in addition to Mexican, in San Cristobal de las Casas: Argentine, Indian, Japanese, Italian, French, Thai, among others – even Burger King and Subway can be found. After my mini mole marathon I was ready for something else: Italian. There are several to choose from. 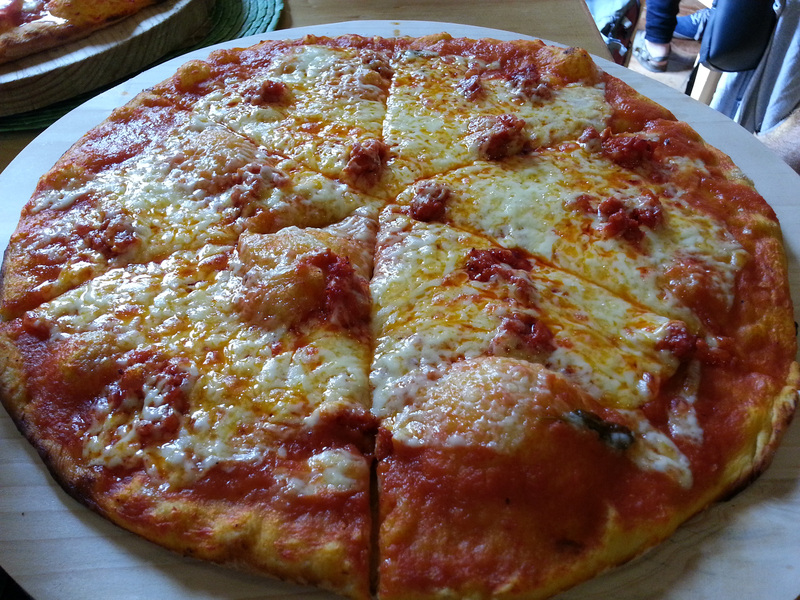 We opted for Napoli Pizzeria, located in the central historic district. It has three tables inside and three more outside, calling it small is an understatement. Yet, the flavors belie the diminutive space. The pizza oven is in the dining area, which can get pretty warm, but it also provides a direct view of the woman whose job it is to roll out the dough and load it with toppings. Besides pizza, two types of pasta are served. Both are freshly made on site and carefully measured, again in full view, before being taken to the kitchen for cooking. 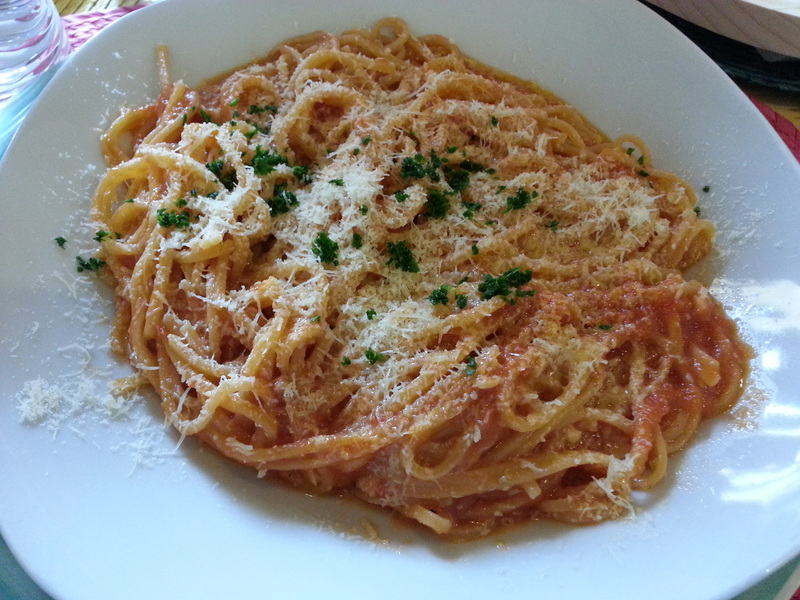 I ordered spaghetti pomodoro, a basic fresh tomato sauce with parmesan cheese. It was comfort food Italian style made in a Mexican kitchen. 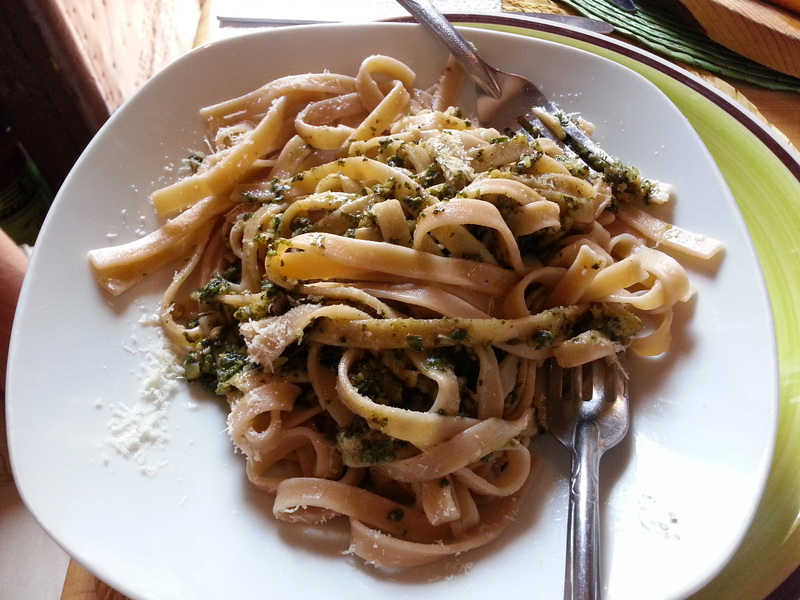 The fettuccini with pesto was also ordered. The pine nuts were evident and provided a nice balance to the basil mix. Both pastas were cooked al dente and the hearty servings left us more than satisfied. Pizzas are available in three different sizes. We ordered two mediums with the intent of have leftovers later. Although the crust was thin, it was sturdy enough to hold the toppings. These included pepperoni, chorizo, and a variety of vegetables. The Mexican state of Oaxaca is well- known for its mole: seven types, although there are likely more. San Cristobal de las Casas in the state of Chiapas doesn’t have as many recognized variations, but certainly holds its own with its interpretations of this traditional dish. I sampled three versions while in San Cris. Mole (mohlay) doesn’t photograph well. It’s a thick sauce the consistency of pancake batter and usually the color of tree bark: dark, except when it’s not. It can also be green, or red or orange. Green is especially unphotogenic, usually because of its base which can be tomatillos, spinach, pumpkin seeds or some combination of the above. TierrAdentro’s version was bland. 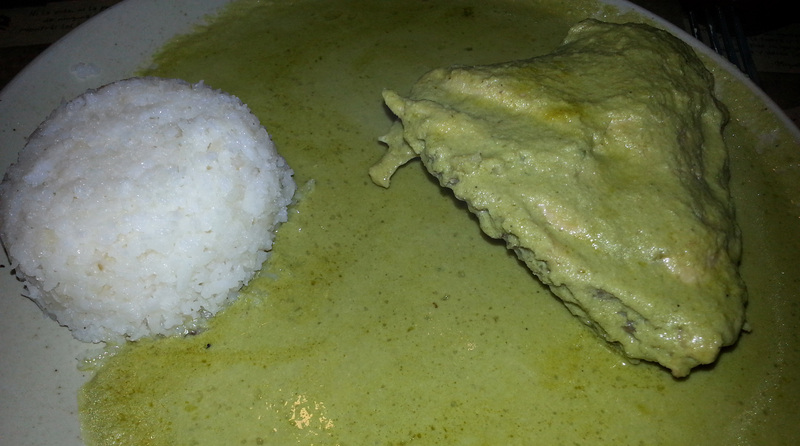 Served over chicken with a scoop of rice on the side, it was difficult to discern any distinct flavors. 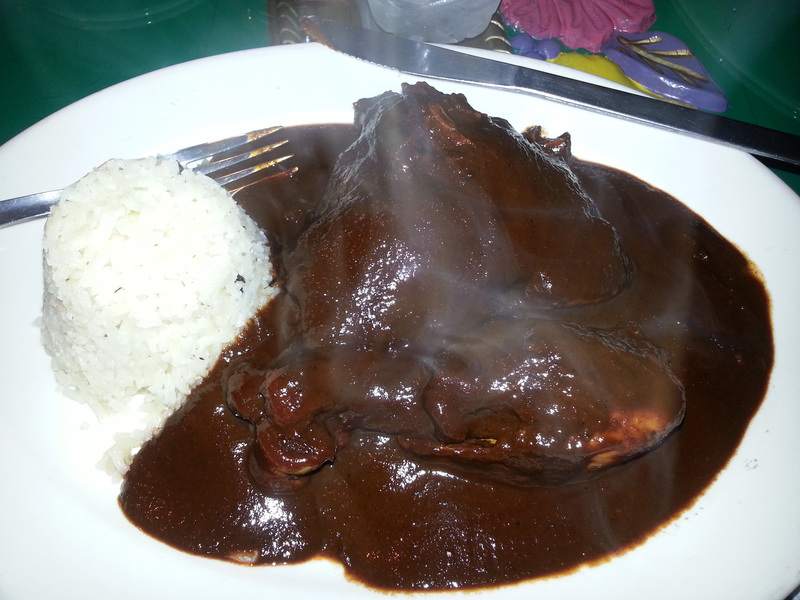 At Casa Maya across from the main square, I opted for traditional mole. It had all the right nuances, but the problem was this was my third mole meal and followed the exceptionally prepared adaptation at Tierra y Cielo. There, Marta Zepeda, an award-winning chef, puts an upscale spin by serving mole over poached chicken medallions and fried plantains. The depth of flavor was a complicated dance of numerous ingredients somehow following the same rhythm. Chocolate, sesame seeds, chiles, tomatillos, garlic, perhaps cinnamon, and much more contributed to what is now best I’ve ever eaten. Some say cocoa isn’t an ingredient, but we checked with our server just to confirm. I could easily have had mole my entire visit and I know someday I’ll try Oaxacan mole to compare, but for now I am satisfied with Zepeda’s.